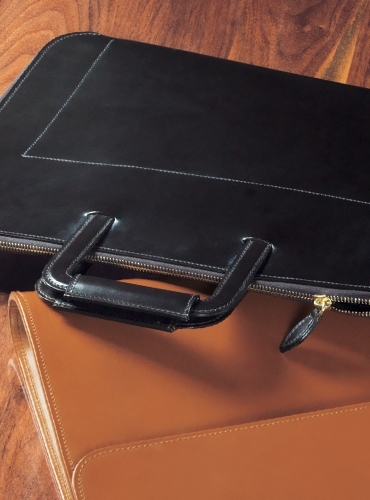 Our hazel bridle leather envelope folder, shown on bottom, is a handsome staple for every day transport of your files. Features a unique fishtail handle that slides flat when not in use and beige pig split interior. Dimensions: 15''x 10.75''x 1.5'' at the opening. 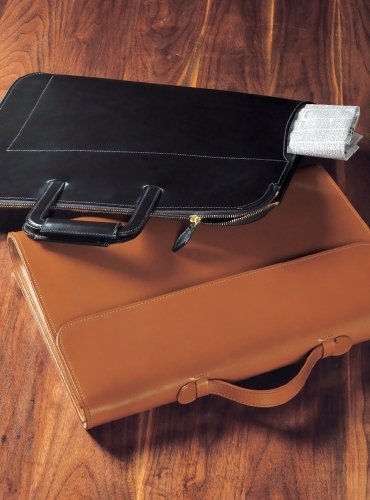 Our deep Havana brown leather document case, shown on top, is an elegant choice to carry your newspaper readily in the front paper pocket. 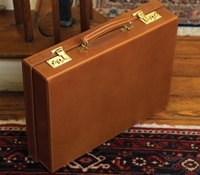 This beautifully constructed piece features an exterior sturdy brass zipper, two easily recessed handles, interior zipper and flap leather compartments, and beige pig split lining. Dimensions: 18''x 12''x 9'' at the zippered opening. 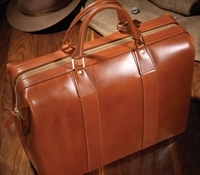 Introducing our collection of the finest bespoke English leather goods. We are proud to emboss our name on these artisan crafted handmade leather goods. 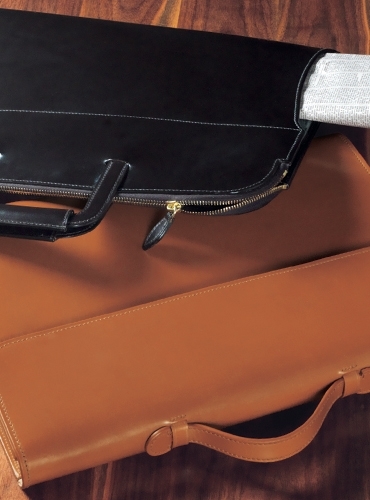 The English workroom producing these bags has a heritage of over 150 years. 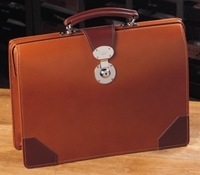 We are satisfied that these are the very best leather goods in the world today, and we offer them as bespoke- made expressly for each order by hand. Although we show a particular shade of London bridle for each piece, we able to tan in other shades shown, upon request.